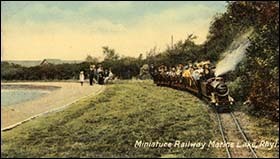 The tiny passenger-carrying railway around Marine Lake is the oldest surviving miniature railway in Britain. It opened on 1 May 1911 – less than two months after the venture received official permission! Holidaymakers boarded six open coaches at the station in the north-eastern corner of the circuit. A steam locomotive, called Prince Edward of Wales, carried them on a circuit around the lake. From 1912 the railway was owned by Rhyl Amusements Ltd, which also developed fairground attractions in the vicinity. By the outbreak of the First World War, the trains passed through an artificial tunnel underneath a giant rollercoaster. The fairground rides attracted more people to Marine Lake, and the railway’s facilities soon had to be enlarged. Extra trains were purchase. In the 1920s and 1930s, the original steam locos were replaced by larger ones, built by local engineer Albert Barnes. 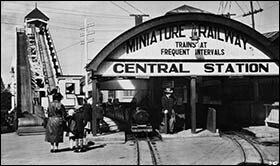 The 1930s also saw the addition of a new structure branded “Central Station”. Its large canopy spanned several tracks, emulating the grandiose glass roofs at famous stations such as Liverpool Lime Street and Manchester Piccadilly. The railway closed in 1969 after Rhyl Amusements handed Marine Lake back to the local council. Most of the locos and coaches went into storage. Enthusiasts reopened the railway in 1978. The “Central Station” had long since disappeared when a new version was opened in May 2007. It provides a booking office and toilets for passengers, and a museum in which steam loco Billy takes centre stage. There are also workshop facilities. The railway is now run by Rhyl Steam Preservation Trust, a registered charity, and is an accredited museum. The public can ride around the lake on certain days from spring to autumn. In 2014, the railway re-acquired its original locomotive, Prince Edward of Wales.